At last. 28 days of keeping eating dairy, meat, oil, and processed food free as the ultimate diet goal are over. Today isn’t the day I’ll be wrapping up all my thoughts on my experience. I’m still processing it all. Having successfully finished this diet in the past, I’m not ending on the high note I wanted to. My dad asked me to post my success earlier today and I replied that I didn’t feel all that successful this time around. He kindly reminded me that the success is subjective. And he is right. So check back in a few days, I promise a positive reflection of life on the Engine 2 Diet. 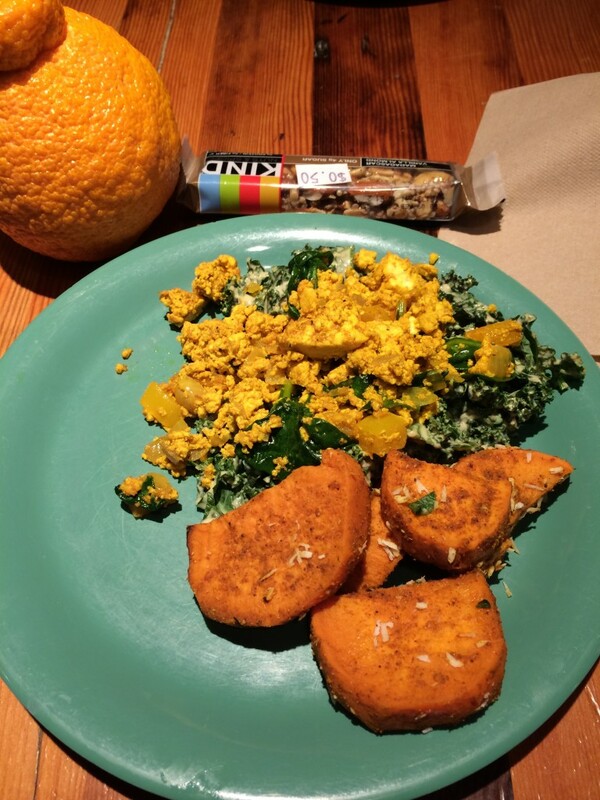 Breakfast: Kale salad with tofu scramble, vegan, but contained oil. Health Starts Here salad of curried sweet potato and coconut with cashews. Pretty tasty. Dinner: Dinner at my mother’s- E2 Chili, slice of Jiffy cornbread. Lunch: Kale and tahini salad, fresh fruit, tortilla chips and some fresh made guacamole, too many handfuls of trail mix. Nothing too terrible in it, some dried pineapple, dried papaya and peanuts. Snack: two endive spears with red lentil pate and a pecan, some other totally unidentifiable stuffed potato snack- definitely had cheese, probably sour cream too. It wasn’t delicious. One QBel peanut butter chocolate cookie, kale chips. Dinner: Catered dinner at a company event: Roll with butter. Salad with frizzled leeks, vegan apple turnip soup. Vegan “cassolette” a tragic mess of vegetables, beans, maybe a mashed cauliflower topping? I’m not sure exactly. It wasn’t very good.